My 4-H kid wanted to try his hand at photography this past year so I gave him a camera and let him go. He was 9-years-old when he took these shots and I was super curious to see what his photos would show. I schooled him a little on how to use the camera and what to look for when he was picking his subject. I begged him to make his photos interesting. The rest was entirely up to him. 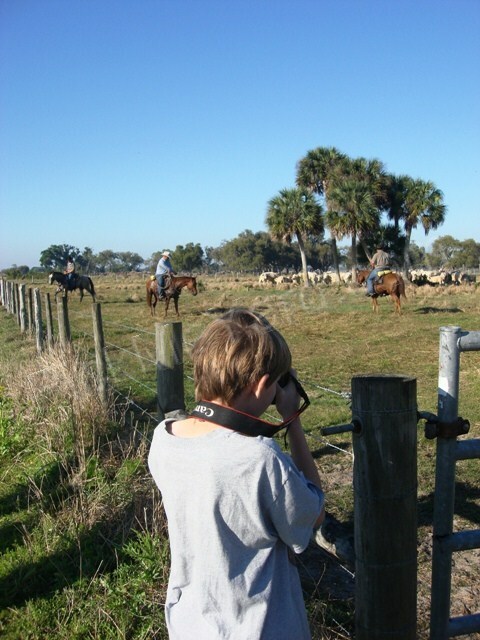 Grayson taking his shots for his 4-H photography contest. 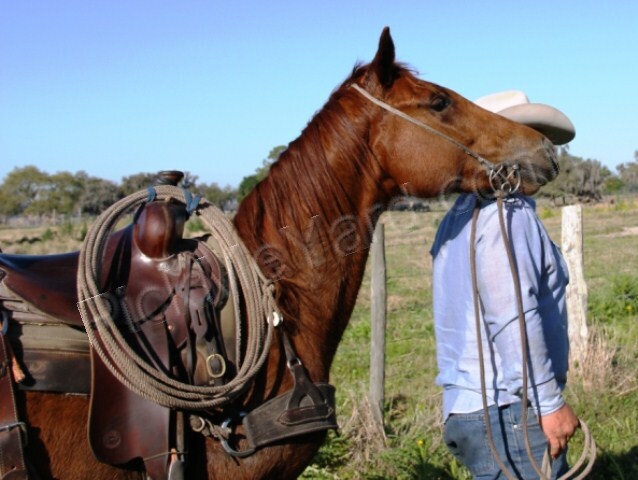 A Southwest Florida cowboy and his horse. The photos are all from a child’s perspective, but I have to add commentary to them. I can’t help myself. The following photo looks like an environmental nightmare. 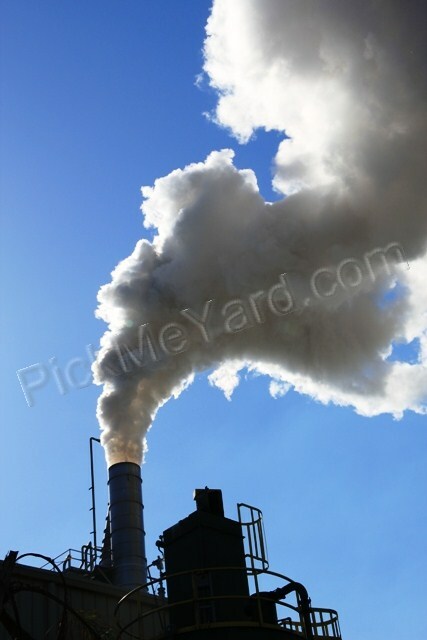 However, the plant has a Department of Environmental Protection office right on their property. 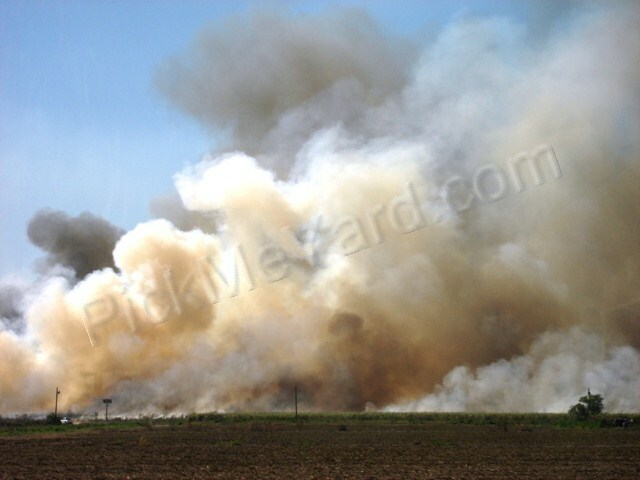 When the smoke gets thick, they immediately take action to lessen it. It was particularly thick when Grayson shot this photo. There was hardly any smoke (and a boring photo) just a few minutes later. Southern Garden Citrus has 3 million orange trees that absorb 613,000 tons of carbon dioxide each year. They use predator insects for pest control and only use chemical methods on particular trees when necessary. 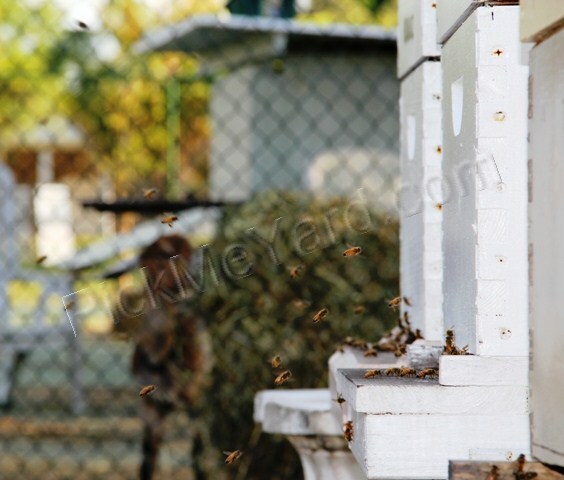 Their orange groves provide habitat for lots of wildlife such as fish, birds and deer… and too many wild hogs. They don’t discard any part of the orange. The pulp, skin and oil are all used for products. Florida is the 2nd largest producer of oranges in the world, (Brazil is 1st, but it’s a fact that Florida oranges are juicier). Southern Gardens orange juice plant. The third largest in the nation. 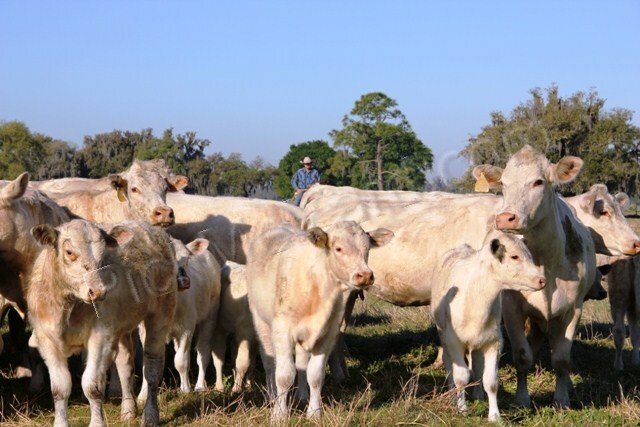 Organic Florida farm. The sugarcane is planted as a wind break. I hesitated to post the following photo. All political views and solutions aside, this is how the food gets to most tables. We have to grow more food. Most countries consume more than they produce. According to an agent at the University of Florida IFAS office, there is expected to be 30-50 billion people on the planet by 2050. Food will become a scarce commodity. Out of the 7 billion people on the planet, 1 billion of them are starving right now. 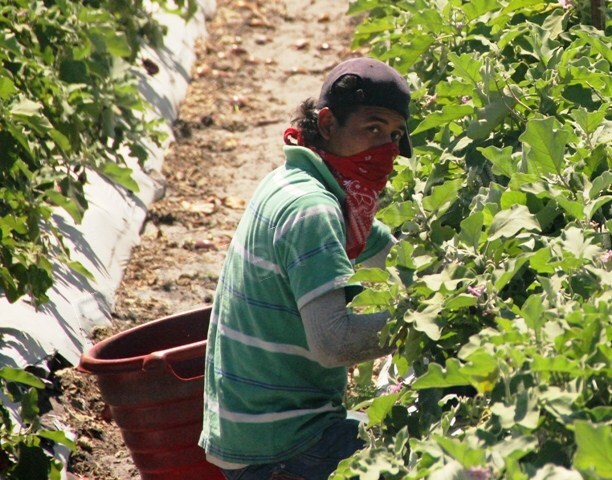 How do we keep up with the food production? 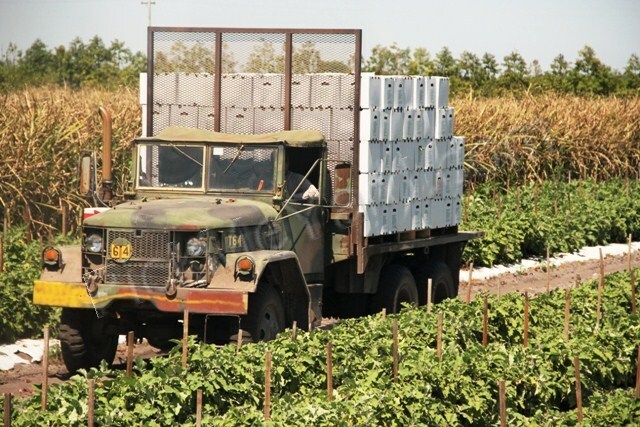 It would be detrimental to the U.S. to rely on foreign food production. Grayson’s perspective is that this guy gets to garden and get paid for it. (I think I need to have Grayson pull more weeds). The dust in this field on the day Grayson took this photo was unbearable. 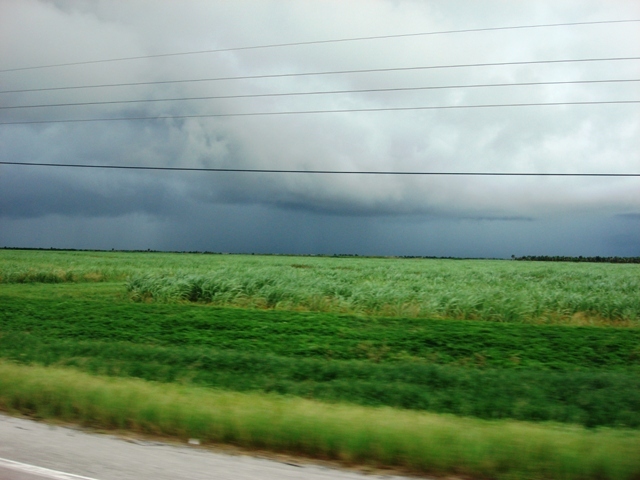 Sugar cane fields behind the U.S. Sugar Corporation in South Florida. 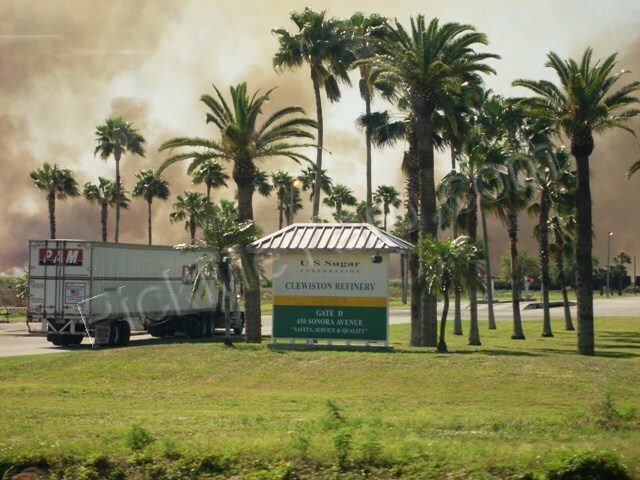 A controlled fire in the sugarcane fields of Clewiston, Florida. Planting begins in late August. Sugarcane can live, and is productive, for 4-5 years on good mulch soils before it is replanted. 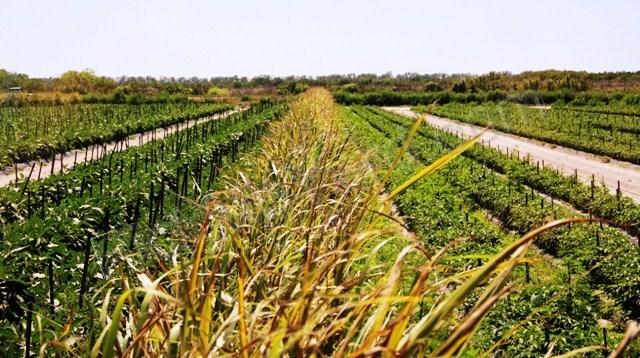 In Florida, rice is grown in rotation with sugarcane. 51% of sugar comes from cane and 49% comes from sugar beet. Sugarcane used to be sprayed with nasty chemicals several times a year to control a pest called the cane borer. However, a small wasp (called Cotesia) was brought in and it kills the sugar cane borer. So, sugarcane is not sprayed with chemicals for pests anymore. They do spray a fungicide though. They’re working on new varieties that will not be as susceptible to disease and will have increased production… probably genetically modified, which I am against. 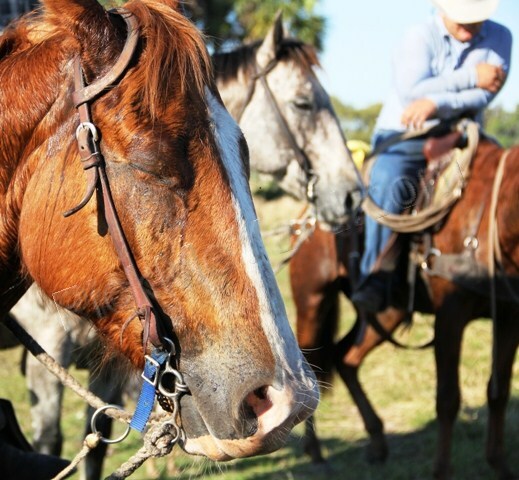 Florida is the nation’s largest producer of sugarcane with over 400,000 acres. Did you know the average American eats (or drinks) 67 pounds of sugar a year? Florida is also the #1 producer of sweet corn, watermelon, bell peppers and snap beans. 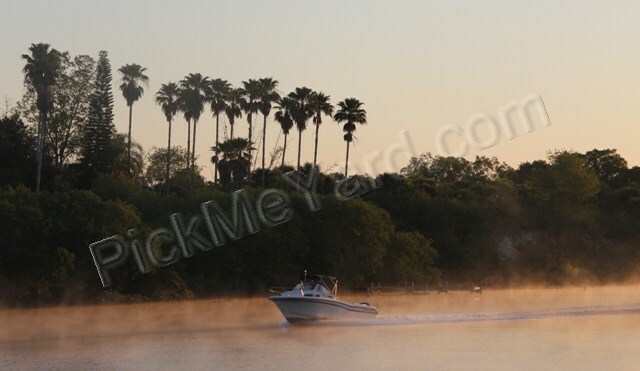 Morning on the Caloosahatchee River. 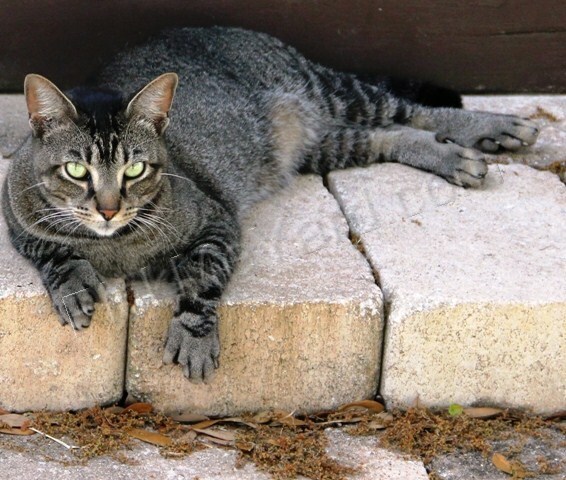 This is our six-toed urban farm cat. He uses those paws like hands. 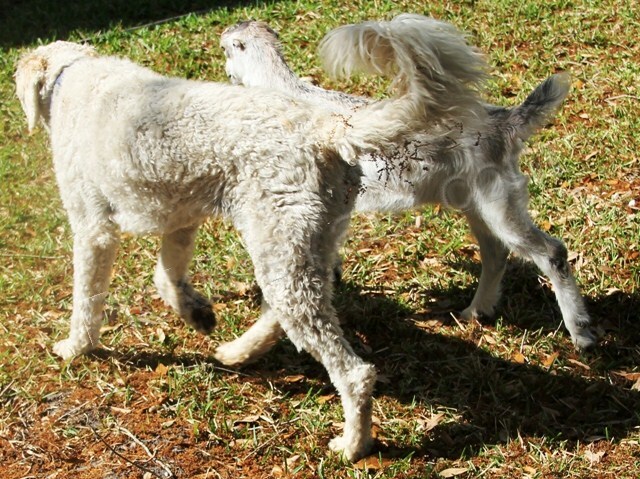 Our Labradoodle and LaMancha (paws and hoofs).... best friends. I harvested all our backyard sugarcane before the early, December freeze in Florida this year. I grew our sugarcane in a round, mulched area where an oak tree died of old age (and serious riverbank erosion) and was completely removed. This photo was taken last summer. The canes were still young. I plant our sugarcane from buds that I get from stem cuttings. I plant them in the ground when it warms up in the spring and then I harvest the cane right before our first freeze in the winter. Sugarcane grows best in tropical climates where they can keep harvesting their stands over and over (sometimes up to 10 times) because it doesn’t freeze. The new stalks that grow up are called ratoons. The U.S. Sugar Corporation is suffering due to the extreme freezes that Florida has endured over the past two years. They’re having trouble finding acceptable seed cane for next year’s crop. U.S. Sugar farms 150,000 acres of sugarcane fields. Newly planted Florida sugarcane. This photo shows what used to be the Everglades. When I harvest our own sugar cane, I cut the sugar cane down at the base, just above the ground. Then, I cut off the green tops. I overwinter the little cane buds and sprouts in a big pot. I grow them in a different spot in my yard each year. This is our third year of enjoying the yummy cane. Some of our backyard sugarcane after being harvested. My kids eagerly wait for me to peel & cut it up for them to chew on. Cane starts I collected to overwinter and use for my next crop. 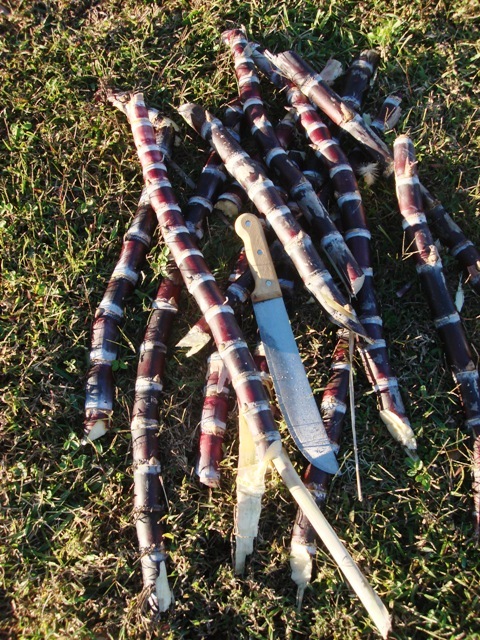 The sugar cane harvest has taught me a skill that I’m quite proud of… using a machete like a Jamaican. I’ve learned to peel the sugar cane swiftly and easily. I’ve even started a machete collection. 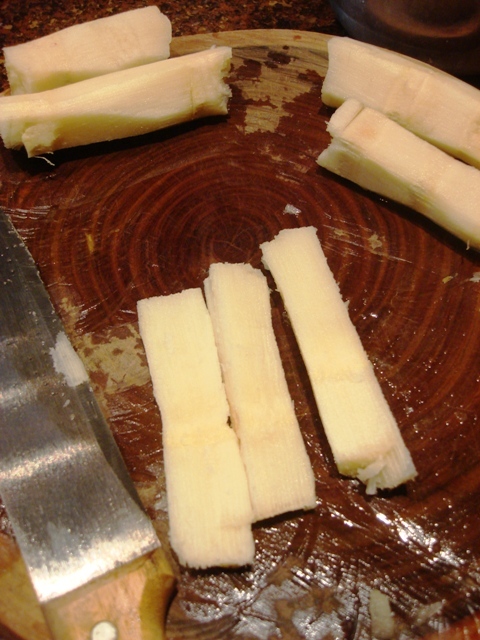 A kitchen knife will not suffice for cutting sugarcane. Slicing the sugarcane into small pieces makes it easy to chew on. It's extremely juicy! 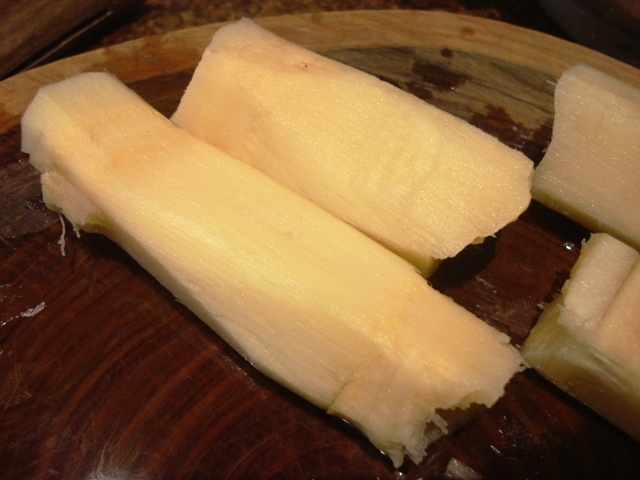 I tend to cut up huge bowls of sugarcane so there’s no arguing over it and everybody can have as much as they want. This is a photo of a small amount. 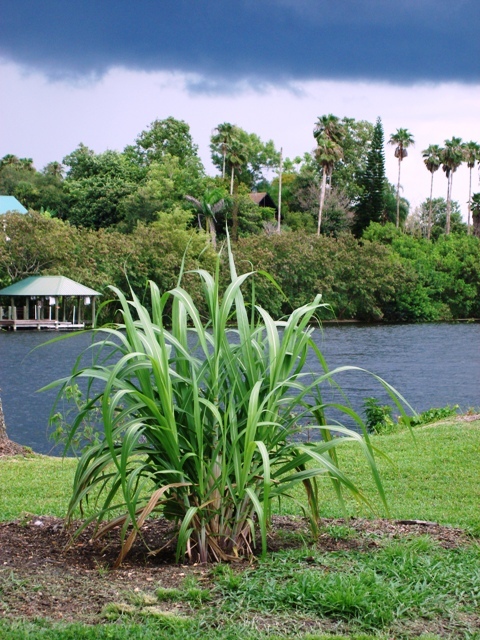 Sugarcane is in the grass family and is easy to grow as long as it has warm temperatures and full sun. 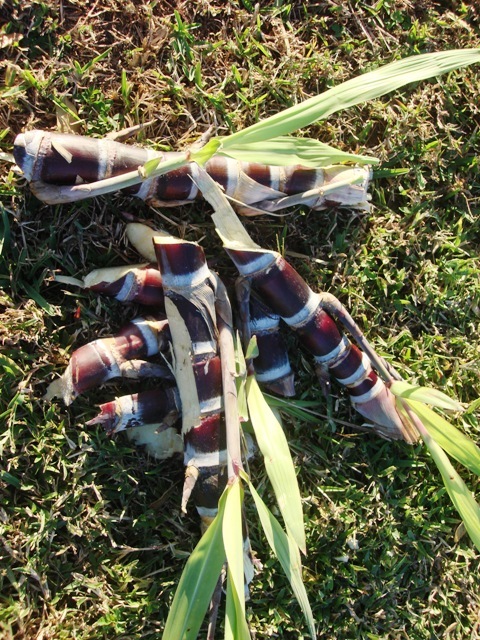 Click here to learn how to grow sugarcane from a store-bought piece. I’ve recently learned that there are different types of sugarcane. 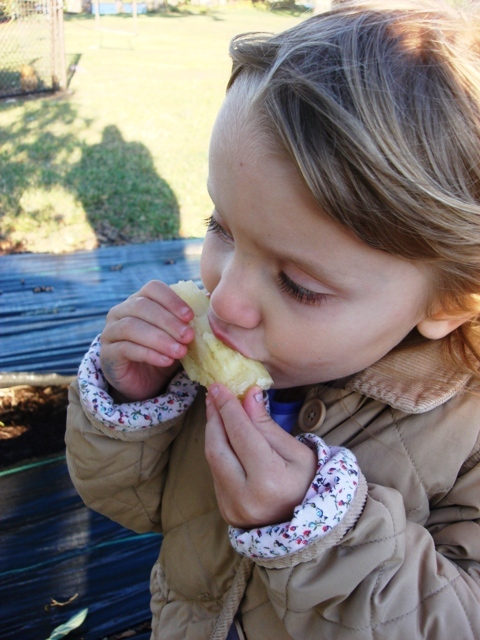 The type most home gardeners would grow is “chewing cane” which is very sweet and good to chew on. The commercial sugar cane growers grow “crystal cane” which is better for processing the sugar crystals. “Syrup cane” is grown for making syrup. I found a great website from the University of Florida on the different canes. Are you wondering why someone would actually grow sugar when most of us are trying to stay away from it? I have always believed that raw sugarcane is very healthy because that’s what I was taught in Jamaica. They chew it for good digestion and healthy teeth. We always buy cut sugarcane and juice from vendors along the roadway in Jamaica. For a sugarcane juice nutrition breakdown, click here. I’ve never found anything comparable in Florida markets, so I grow my own. We are hooked on growing our own backyard sugarcane for life. 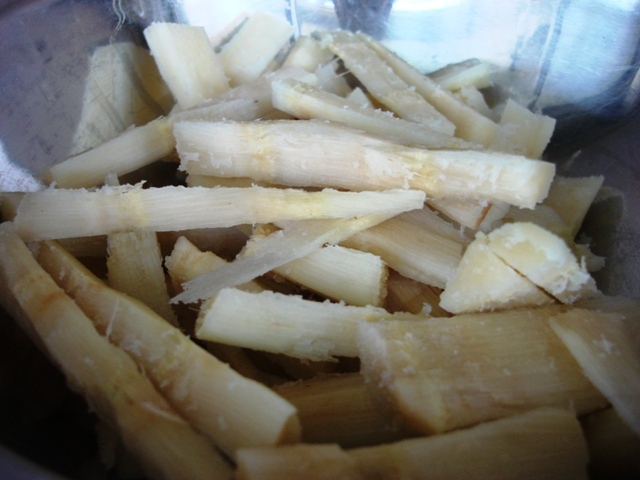 My family has found great pleasure in cutting and chewing our sweet, sweet sugarcane. I’m going to grow much more of it this year. I’ll keep expanding my machete collection and I’m even looking into a household sugarcane extractor.